Do you want to convert batches of images from any type to any type or to icons? You have come to the right place, using image converter you can convert batch of images to any types in seconds using a very easy to use wizard style interface, just follow the simple screens and let the wizard do all the work for you, additionally you can convert batch of images to icons or vice versa. Converting from any image formats to any image formats, More. 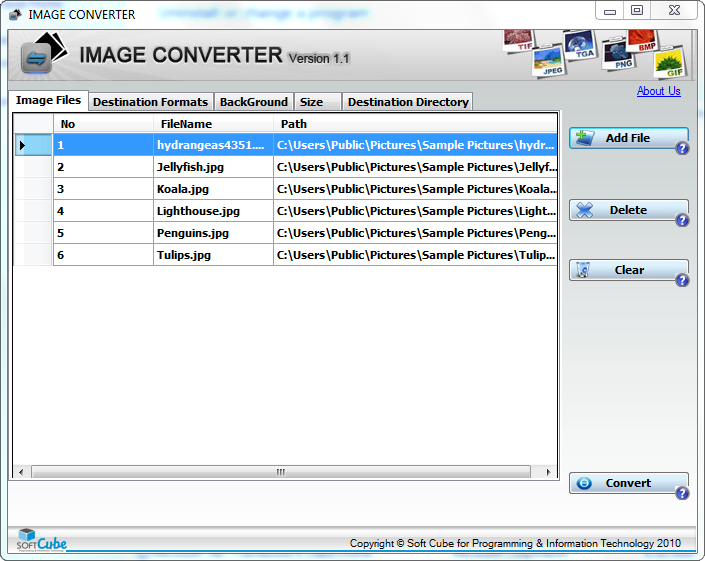 Image converter - convert batch of images to any image formats or icons. image conversion application convert image to JPEG, GIF, BMP, TIF ,PNG formats..
Qweas is providing links to Image Converter 1.1 as a courtesy, and makes no representations regarding Image Converter or any other applications or any information related thereto. Any questions, complaints or claims regarding this application Image Converter 1.1 must be directed to the appropriate software vendor. You may click the publisher link of Image Converter on the top of this page to get more details about the vendor.